It’s no secret that the poke trend is taking Seattle- and the entire country- by storm. 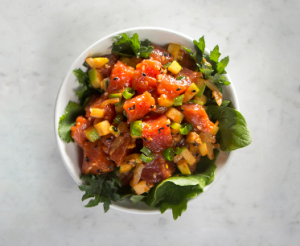 And while it seems this hot craze is new to the scene, traditional Hawaiian poke has actually been around for centuries. Seriously- centuries! So what makes poke so popular? Well it’s healthy, delicious, and so customizable! The raw fish salad is traditionally made with cubed ahi tuna, seaweed, onions, and an Asian inspired dressing made of soy sauce, ginger, sesame oil, and sesame seeds. But these days poke shops offer much, much more- allowing YOU to tailor your experience! And living in the Northwest we also love our salmon poke. Just be sure to use Alaska Salmon that has been previously frozen for safety purposes. Here are some fun Poke recipes that we worked on! And lucky for us- Seattle has some amazing poke restaurants that are a must-try! 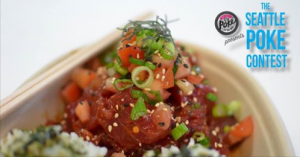 My go-to spot is Poke To The Max, created by the Hawaiian poke legend Chef Sam Choy. With locations in Tacoma, Hillman City, and 3 mobile food trucks that travel throughout the Seattle area- it’s easy to become a regular. On August 21st you can really get your poke on at Chef Choy’s Seattle Poke Contest where dozens of local chefs will come together to prove that their take on the dish is the best. Expect live music, delicious food and drinks, and of course- lots and lots of POKE! And if that’s not enough to convince you- each ticket purchase benefits The Bennett Foundation, founded by Seattle Seahawk’s beloved Michael Bennett! So get out there and enjoy great food, for a great cause. When summer time finally hits the Pacific Northwest, burgers are the first thing on my mind. To me, the smell of a burger sizzling on an outdoor grill is simply intoxicating. I’ll always love a classic beef patty piled high with condiments and spreads, but sometimes it’s fun to switch it up. Burgers are a blank canvas to get creative and try new combinations. Your local farmers market is a great place to find inspiration. Outdoor BBQ in your weekend plans? Create a burger bar and make it interactive with a DIY set-up! Simply pre-heat your grill and have it hot and ready. Pick up some artisan buns and set out a variety of cheeses and spreadables like spicy sriracha mayo, fun mustards, local pickles, and grilled sweet onions. Offer unique patty options to please the whole crowd- like local grass fed beef, veggie black bean burgers, or seasoned turkey patties. Or why not try my Barbequed Salmon Burgers on Lemon Dill Buns! 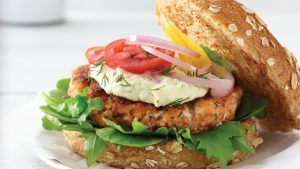 The smoky grilled salmon patty paired with fresh condiments like lettuce, cucumbers, or a tangy vegetable slaw is knock-your-socks-off delicious. If baking your own buns seems daunting, not to worry! Just pick up your favorite from a local bakery and get to grillin’. Make sure to have your guests bring some tasty sides, ice cold brews, and wine. And while the grill is still hot – throw on a few bananas for making up some grilled banana splits for a sweet ending – yum! Any combination of burger goodies you like, such as tomato, lettuce, onion, cucumbers, vegetable slaw, etc. To make the burgers, chop the salmon well. Mix it thoroughly with the remaining burger ingredients in a medium bowl. Divide the mixture into 4 portions and shape into 4 ½-5 in diameter well-compacted round patties. Refrigerate the patties, tented, for at least 30 minutes or up to overnight to firm. Pre-heat a grill to high and oil. Carefully place patties on grill and cook for about 2 minutes per side. Split buns in half and toast lightly. Spread mayonnaise or tartar sauce onto buns, add the cooked patties, and pile high with garnishes of your choice. Local Salmon The Big Kings Are Coming In! Nothing says Pacific Northwest like salmon, and it’s that time of year again when this rich, delicious local gem is readily available. Bring on the summer sun, its salmon-cooking season! There are several varieties of salmon available locally that can fit any budget and taste, from sockeye to King. Salmon’s natural oil and fat content help keep it moist and tender, even when grilling, but you can help it stay that way with a flavorful brine. Brining possibilities are endless: white wine and savory spices, brown sugar and soy, or simply sugar and salt brine – just dunk your pieces for 15 minutes or so before cooking. Salmon makes the perfect platform for glazes, marinades and other tasty toppings. 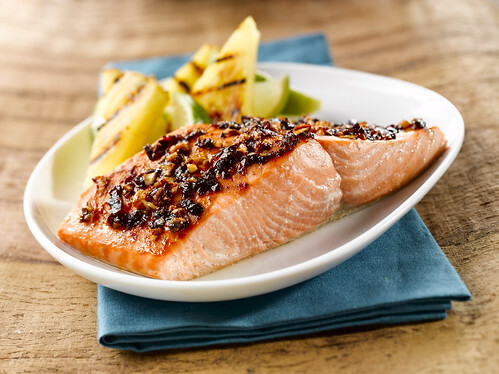 How does roasted king salmon with a Chipotle Honey Glaze or an Orange Ginger Butter sound? Or contrast salmon’s rich meatiness with a fresh and zesty Zesty Lemon Basil Vinaigrette. Makes me want to fire up the BBQ right now! So whether you’re smoking, grilling, or oven-roasting it, get your wild salmon on while it’s in season. Stir together in a small bowl until well combined. Store refrigerated for up to 2 weeks. *To make chipotle purée: Purée a can of chipotle peppers in adobo sauce with a hand blender, blender or food processor until smooth. Freeze any remaining purée for another use. Switch this basic recipe up with different combinations of citrus and herbs. Change out the ginger for garlic and try using a different mustard as well. Roll up different variations into logs in plastic wrap and freeze for up to 4 months. Just slice off a few pieces for a salmon topping anytime. Place all ingredients except the green onion in a food processor. Process until smooth and emulsified, scraping down the sides of the work bowl often. (If the butter doesn’t come together right away, be patient and continue processing.) When the mixture is well blended, add the green onion and pulse until mixed. Keep refrigerated, tightly covered, for up to 7 days. This quick and easy homemade dressing is delicious drizzled over salmon. You can switch up this basic vinaigrette recipe by changing out the basil for cilantro and the lemon for lime, and/or adding a dash of hot sauce for some zing. You can also double the recipe and add all the ingredients at once to a blender to make a more creamy dressing. Place the lemon juice, honey, mustard and garlic in a small bowl. Whisk to combine. Continue whisking and drizzle in the oil to incorporate. Then stir in the basil, salt and pepper. Store refrigerated for up to 10 days.